Did the governors of Michigan and Pennsylvania cut education funding or increase it? Claims from gubernatorial candidates and their opponents about education funding in Michigan and Pennsylvania couldn’t appear to be more conflicting. What gives? The disparate claims in both states have similar roots. In both states, education funding was bolstered by a temporary infusion of federal economic stimulus dollars prior to the Republican governors taking office. When that federal funding dried up, schools got less, even as the state’s share of contributions to education increased. In addition, both states’ governors are paying more toward the education employees’ retirement system, translating to less state money actually going to classrooms. Sue Corbett also boasts that with her husband as governor, Pennsylvania is “one of the top states in the country in what we spend per pupil on education.” But that’s because of local spending – not state spending. The state contribution to per-pupil spending is in the middle of the pack, in raw dollars. As a percentage of public school funding, Pennsylvania’s state contribution ranks 45th. Education funding is shaping up as a key issue in several state races around the country, including the gubernatorial races in Michigan and Pennsylvania. A Franklin & Marshall poll released on May 14 showed education was the top issue among Democrats in Pennsylvania. And in Michigan, a poll released in late May found “improving the quality of education and increasing funding” was the second most important issue in the state, with 17 percent listing it as the top concern. And so the war of words between candidates on education funding has begun in earnest, with the Democratic challengers claiming the sitting Republican governors have slashed education funding, while the Republican governors claim they have increased education spending. Kantar Media Intelligence’s Campaign Media Analysis Group, which tracks political ad spending, told us that nearly $15 million has been spent on education ads in the Michigan and Pennsylvania governors’ races since the first of the year. As with many political issues, this one comes down to carefully worded messaging, such as whether one considers contributions to retirement systems part of education funding or only dollars that go directly to classrooms. There’s no question classroom budgets in Michigan and Pennsylvania have been squeezed, as schools were forced to eliminate thousands of teaching jobs and increase class sizes. But is a lack of state funding to blame? We’ll sort through the facts behind the competing claims. Contrast those depictions with comments by Snyder in his Jan. 16 State of the State Address, in which he sought to “set the record straight” on “misinformation” about education funding in Michigan. Snyder, Jan 16: I firmly believe in investing in K-12 education, and I’m proud to say, in the last three years we’ve increased educational spending at the state level for K-12 each and every year to the point where we’ve invested $660 more per student than there was previously before I took office. That’s a huge investment in K-12 education. In February 2011, Snyder proposed a budget that called for a $961 million reduction in school aid (see B70). But a couple caveats are in order. The previous year’s school aid included $520 million in federal stimulus aid, and that money was no longer available. In addition, as the Detroit Free Press noted earlier this year, not all of those initially proposed cuts came to pass. Detroit Free Press, Feb. 2, 2014: School districts howled, state revenues improved, and lawmakers — with Snyder’s support — responded. By the time the budget was finalized, the cut was reduced to closer to $500 million, with nearly all of that related to lost federal funding. 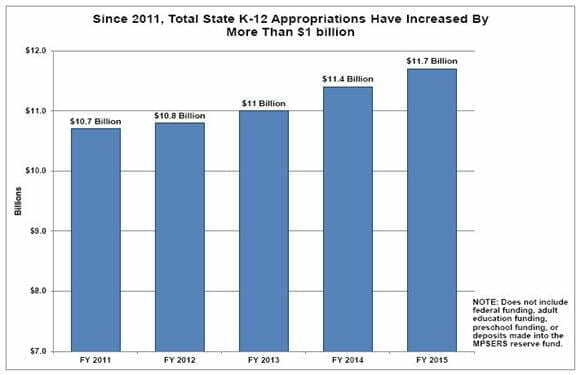 Then it turned out the 2011 estimates were wrong and the state ended up spending $180 million less than expected on school aid during [Gov.] Granholm’s last year. As a result, the state’s share of education funding (not including federal aid) increased by about $134 million, bumping total state aid from about $10.7 billion in 2011 to $10.8 billion in 2012, Snyder’s first year. State aid has steadily increased each year since then, with the projected funding next year at $11.7 billion — $1 billion more than before Snyder became governor. A chart from the Michigan Department of Technology, Management and Budget shows the progression in state funding. But that doesn’t mean schools saw more money. In fact, with the state no longer getting pass-through stimulus grants for education, schools actually saw $393 million less overall. The Schauer campaign isn’t buying the excuse that school funding cuts are due to expiring stimulus grants, arguing that money should have been accounted for. Adding to school woes is that a greater share of state funding is being earmarked to stabilize the retirement system. So that much less is getting to the classrooms. “Really, what is at the crux of the debate is whether state assistance to help pay for retirement assistance should be counted,” said Kurt Weiss, a spokesman for the Michigan Department of Technology, Management and Budget. While some educators say more money to the retirement system means less money to the classroom, proponents argue that if the state didn’t make payments toward the retirement system, the local school districts would have to do so. As the following chart from the Michigan Department of Technology, Management and Budget shows, the per-pupil spending for basic operations dropped a bit in Snyder’s first year. It has only recently, and just barely, exceeded the pre-2012 level — even as the state’s contributions to the school employees’ retirement system and total per-pupil spending has increased every year. Whether retirement system contributions ought to count as education funding is a political argument, and we take no position on it. We simply note that it is credible for Snyder to claim that the state’s share of education funding has increased under his leadership, while it’s also credible for his opponents to criticize claims about $1 billion in extra school funding, when a larger share of those dollars is going to the retirement system rather than the classroom. Many of the same issues are in play in Pennsylvania, where education funding also has emerged as a major issue in the governor’s race. Sue Corbett: He’s increased spending in the education department by $1.5 billion over what it was when he came into office. Pennsylvania is at the highest it’s ever been for spending in education. We’re also one of the top states in the country in what we spend per pupil on education. Those claims stand in stark contrast to the way Corbett’s Democratic opponents describe his record on education funding. So did Corbett increase education spending by $1.5 billion or slash it by $1 billion? As with Michigan, the two main variables are the end of federal stimulus dollars and increased state payments toward the education employees’ retirement system. In his claim that Corbett cut education funding by $1 billion, Wolf is referring to the first budget proposed by Corbett after he came to office in 2011. School districts received about $860 million less in funding (including federal stimulus grants) for the 2011-2012 school year than they did the year before. But the previous two years of education funding were propped up by $1.3 billion — $654 million each year — from the federal stimulus. More than half of that federal money supplanted previous state funding (meaning the state contributed less those two years, but the school districts got more). In other words, state dollars were replaced by federal dollars — and then some — to get states through the recession. Within weeks of taking office, Corbett reduced the state appropriation for school districts for basic subsidies by $335 million, Ron Cowell, president of the Harrisburg-based Education Policy and Leadership Center, explained to us in a phone interview. The cuts affected poorer school districts more dramatically, because of cuts to charter school reimbursements. Charter schools tend to be more prevalent in poorer, urban school districts. The education funding picture is further complicated by the fact that a larger share of state funding went toward school employee pensions than in years past, due to a large increase in the obligations to the retirement system (set by the state Legislature), Cowell said. So while more money was going toward education, less was making its way to the classrooms. In fact, that kind of spending still isn’t where it was several years ago. 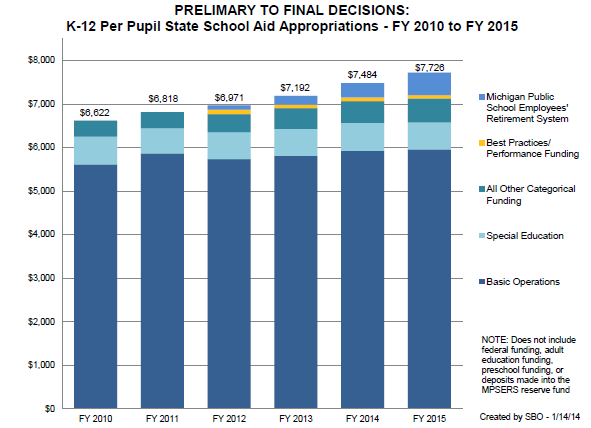 The following graphic from the Pennsylvania Budget and Policy Center illustrates the changes in funding over time. ARRA is the American Recovery and Reinvestment Act, otherwise known as the federal stimulus. As the graphic shows, education funding took a significant hit in Corbett’s first year in office, even as state contributions increased (due to the expiration of the federal stimulus funds). In addition, state funds going to employer pension payments increased significantly. State funding going to pre-K-12 programs remains below the amount the state contributed six years ago in 2008-2009, and well below that achieved during the two years of stimulus contributions. As for Sue Corbett’s boast that “[w]e’re also one of the top states in the country in what we spend per pupil on education,” that’s accurate, but hardly worth Corbett boasting about. It’s true that Pennsylvania’s per-pupil spending of $13,340 in 2012 — the latest data available from the U.S. Census — ranks 13th highest in the country. That’s well above the national average of $10,608 per pupil (though less than neighboring states such as New York, $19,552; New Jersey, $17,266; Delaware, $13,865; and Maryland, $13,609. But that’s largely due to the generosity of local taxpayers, not the state. The $5,813 in per-pupil dollars coming from the state in Pennsylvania in 2012 ranked 21st — and was less than every abutting state except Ohio. The per-pupil dollars coming from local sources — $8,967 in 2012 — ranked 6th. As a percentage of elementary/secondary public school funding, Pennsylvania’s state contribution — 36.1 percent — is well below the national average of 45.5 percent, and ranks 45th. In other words, Pennsylvania is “one of the top states in the country in what we spend per pupil on education” because of generous local contributions, not state dollars. Center for Opinion Research, Floyd Institute for Public Policy, Franklin & Marshall College. Franklin & Marshall College Poll. 14 May 2014. Egan, Paul. “Poll: Crumbling Michigan roads No. 1 issue for voters.” Detroit Free Press. 25 May 2014. Hahmann, James. “DGA reserves $6 mil in Michigan fall airtime.” Politico. 4 Jun 2014. Hoffman, Kathy Barks. “Gov. Snyder signs $47.4B Michigan budget Tuesday.” AP. 21 Jun 2011. Snyder, Rick. 2014 State of the State Address: Gov. Rick Snyder. 16 Jan 2014. Michigan Department of Technology, Management and Budget. Executive Budget Fiscal Years 2012 and 2013. 17 Feb 2011. Egan, Paul. “Analysis: More money for Michigan’s schools, but not for its classrooms.” Detroit Free Press. 2 Feb 2014. Gov. Rick Snyder’s Government Website. The Facts on Education Funding in Michigan. O’Toole, James. “Corbett announces he will run for governor in 2010.” Pittsburgh Post-Gazette. 15 Sep 2009. Weingarten, Randi, Jordan, Jerry and Kirsch, Ted. “Open letter from Randi Weingarten, Jerry Jordan and Ted Kirsch to Pennsylvania Governor Tom Corbett.” 22 May 2014. U.S. Census Bureau. Measuring America: Spending on Education. U.S. Census Bureau. Public Elementary–Secondary Education Finance Data, 2012 Survey of School System Finances Tables.